started young exploring the sounds of Melbourne’s unique club scene. In 2011 at just 18, Powell taught himself the craft and artisanship of DJing. It was then he started developing an ear for quality house music rooted in creativity and good-time vibes, honing his intuition with the audience. 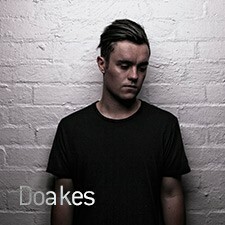 Within months of his club debut, now under the moniker Doakes, Powell had rapidly gained experience in the scene, experimenting with deep/tech house music behind the decks at some of Melbourne’s hottest club nights and most respected music institutions, including the globally recognized Revolver Upstairs. Doakes’ original sets have since evolved into an amalgamation of the cerebral meets primal. You’ll hear and feel anything from impassioned, heavy, driving beats to melodic and conscious interludes, reinvigorating the art of creating party vibes that guarantee a club full of energy and groove.